Cremation jewelry is designed to hold a pinch of ashes or another remembrance in memory of a beloved family member or friend that has passed away. The keepsakes have an inside compartment where a memory can be placed and the jewelry comes in pendants, rings, bracelets and more. For some people, though, the thought of wearing a memory of their loved one is not necessarily something that they are comfortable with. And that is perfectly okay! There are several different ways that cremation jewelry can be displayed as a memorial to a loved one without displaying the jewelry on your body. One option for displaying your cremation jewelry is to select one of our domed displays. A popular option with our customers, the displays have a silver or gold base and a glass dome top. Suspended from the inside top of the dome is a small hook where your cremation jewelry will rest. The chain can be looped over the hook or, if the bail is big enough, the hook can slide through the bail to hold your keepsake suspended. Place the dome on a nightstand in your bedroom, on a visible shelf in the kitchen or office or even on a pedestal in the foyer or family room. 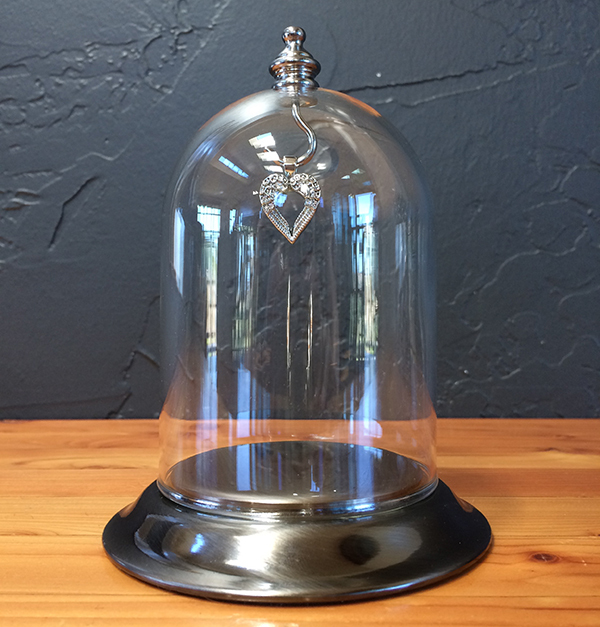 Our display domes also make for a safe resting place for your jewelry when it isn’t being worn. 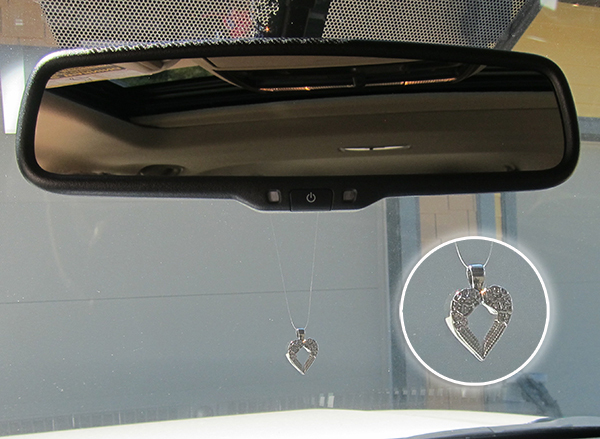 Your cremation jewelry can also be displayed from the rearview mirror of your car. Fill and seal your keepsake with the remembrance of choice and using either fishing line, a clear filament with magnetized ends or even a ribbon or chain, slide through the bail and tie around the mirror. Be careful to not tie in your line of sight or where it will obstruct your view while driving. This is an ideal option for individuals that spend a great deal of time in the car or on the go and let’s you take a loving memory with you on all of your travels. If you have a china hutch or a display case where items that have special significance, have been passed down from generation to generation, small antique figurines, etc. 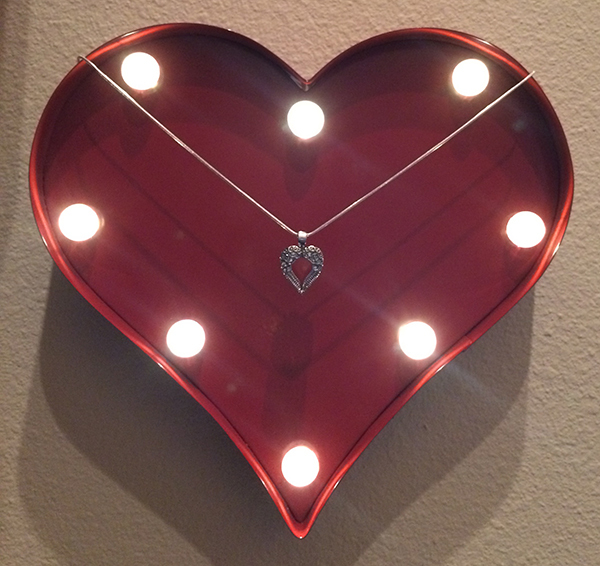 are on display, why not add your memorial jewelry as a beautiful representation of your loved one! Not only does this house the jewelry in a safe place but it also allows others to take part in enjoying the beauty of your memories and adds to the personal nature of the other mementos on display. You can even have a small easel and plaque engraved to sit with the pendant in memory of your loved one. Many individuals have shadow boxes that have been crafted to hold sports metals, certificates, favorite pictures or verses or other items of particular special importance. A cremation pendant can also be beautifully displayed in a shadow box. 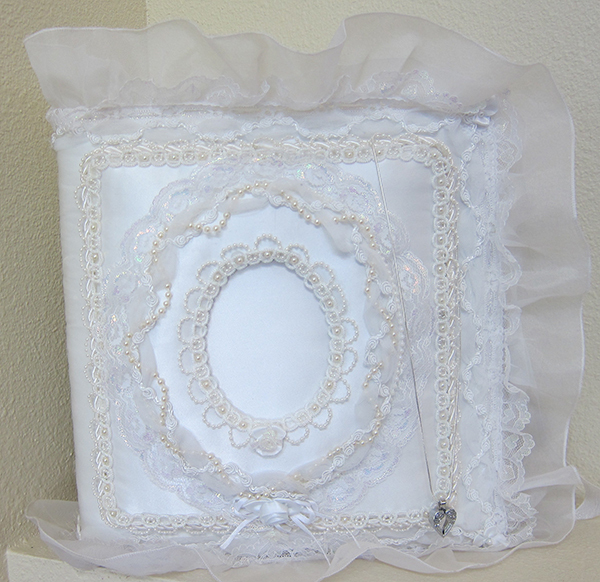 Hang the jewelry in the shadow box as the sole focal point or display the cremation jewelry with other items - either is fine. Displaying the pendant in a shadow box is a great idea for older children or young adults and let’s them have their own ‘space’ for a selected memory. If your shadow box is not glass covered, periodically wiping the exterior of the keepsake with a lint free cloth will help prevent any build up on the surface and keep it looking brand new. 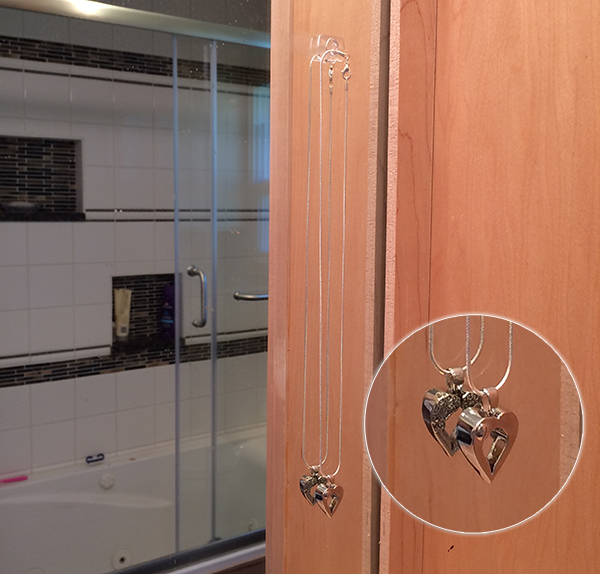 Keepsakes make a beautiful addition to a bathroom mirror and can be suspended on a hook that adheres to the mirror itself or even suspended from the corner of the mirror. This allows you to have a memory of your spouse, your child, someone close to your heart with you as you get ready in the morning. The mirror also serves as a beautiful reflection of the keepsake. We suggest that you place the keepsake in a dry area or small jewelry bag when showering as constant exposure to steam from a shower can compromise the beauty of the metal. Choose some strong line from a fishing pole or clear filament to hang from the window. Tie a secure knot on the ends together after you pass the filament through the bail. Using a thumbtack, push the pointed end of the tack into the frame with the filament tight between the frame and thumbtack. Make sure the thumbtack is secure in the frame by tugging gently on the pendant once it’s hung. Hang the pendant high enough that it is free from little hands, doggy feet or where it won’t dislodge from the window being opened. The top panes work best for bottom opening windows and will be far enough out of reach of children and pets. 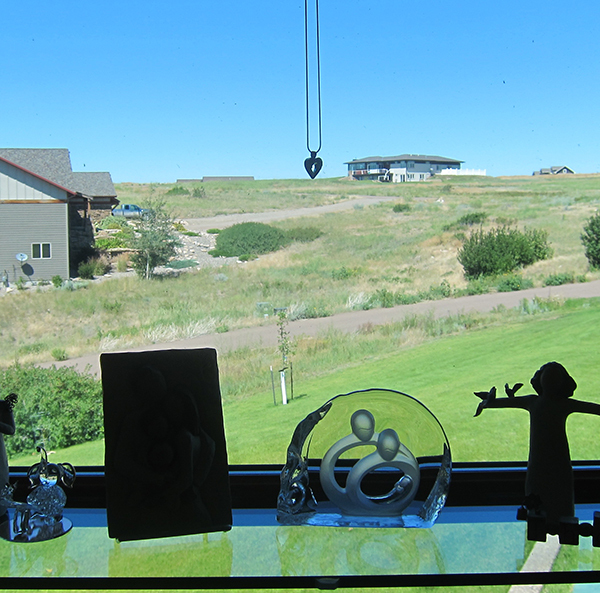 Glass or crystal keepsakes may work best for being hung in a window pane. They are resistant to tarnishing and fading and the color of the glass will be reflected on the walls when hit with direct sunlight. If choosing a metal keepsake, clean the pendant periodically with a dry lint free polishing cloth to remove any dust build-up and keep your pendant looking brand new. Never submerge your cremation jewelry in water. Where do you spend the majority of your time? What are you passionate about? Do you tinker in the garage? Have a locker at work? What a great way to not only keep the memories of your loved one with you but also have a tangible and beautiful tribute to them while you are going about your day! 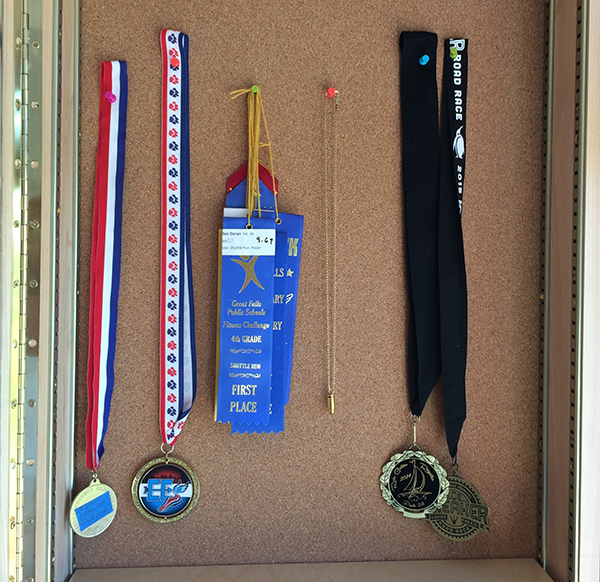 Suspend a keepsake from the interior of your locker at school or work or even hang from a peg out on your work bench. Drape your memory over the corner of your bulletin board where you place your reminders, your inspirations, your motivational quotes. 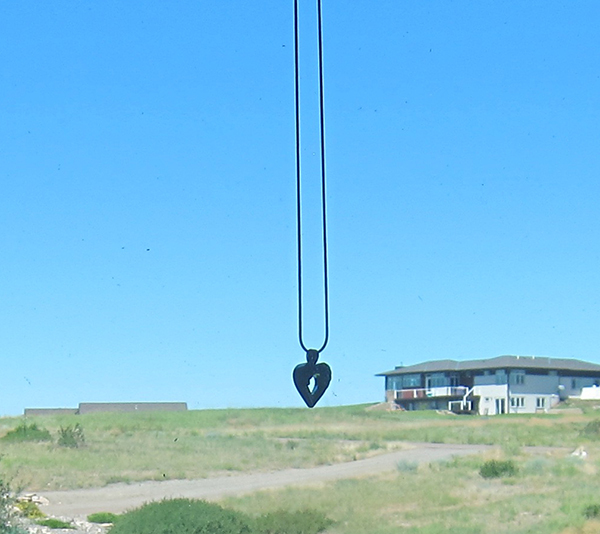 Displaying the keepsake in an area where you are apt to see it often ups the emotional value of the pendant and you never have to share what is inside the pendant. Be sure to place the pendant in a safe place when you are not in the area if it is a space that is frequented by several different people so as to prevent accidental loss or theft. When a loved one passes away, many families will create a space in their house where a picture of their loved one is placed and serves as a visual reminder of someone they cherished. 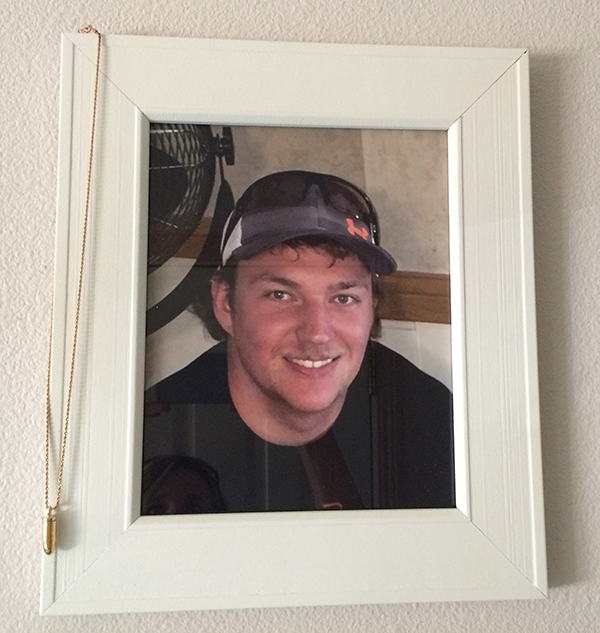 A cremation pendant can be draped over the corner of the picture frame and this works whether the picture is suspended on the wall or set on an end table or pillar. You can use a chain or even a ribbon as a way to suspend the keepsake and adjust the length of the selected cording appropriately. You don’t want the keepsake hanging too far down below the picture nor lying on the table next to the picture. It should rest gently against the side of the picture frame. 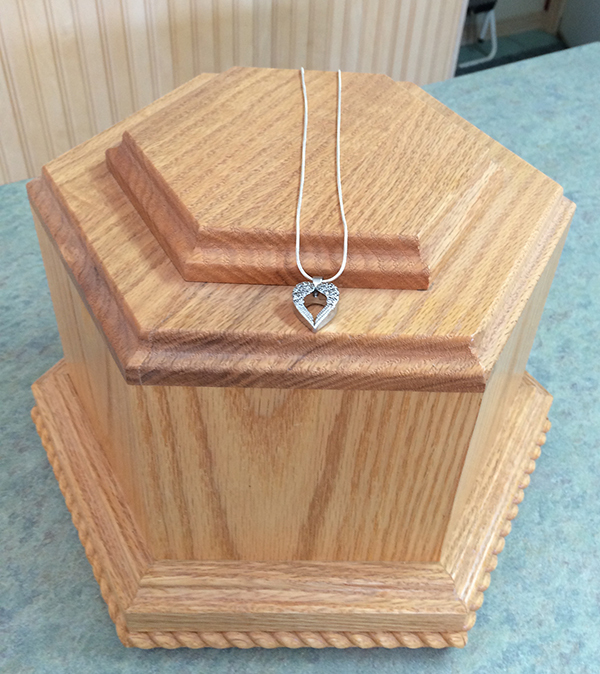 Your cremation jewelry can be placed over the top of the cremation urn where the ashes of your loved one have been laid to rest. The pendant can be laid directly across the top or you could even place a small piece of fabric on top of the urn where the pendant will rest. If displaying the keepsake along with the urn, be certain that the urn and the jewelry are not in a high traffic area or on display on something that is likely to get jostled. Also, it’s a good idea to use a lint free cloth to weekly wipe the surface of the urn as well as at the surface of the jewelry to remove any miscellaneous dust or build up. We all have those items that we hold dear to our heart and would be the things we would grab and bring with us in times of duress or emergency. These items make for a wonderful backdrop for your keepsake and allow you to add to the special nature of that particular item. Wedding, baby or photo album. For those that have lost an immediate family member such as a spouse or a child, this is a touching way to display your continued devotion and love. The album can be displayed on an easel on a book shelf, a pillar or a mantle. The pendant can be placed over the corner of the album in memory of your loved one. Teddy bear or stuffed animal. 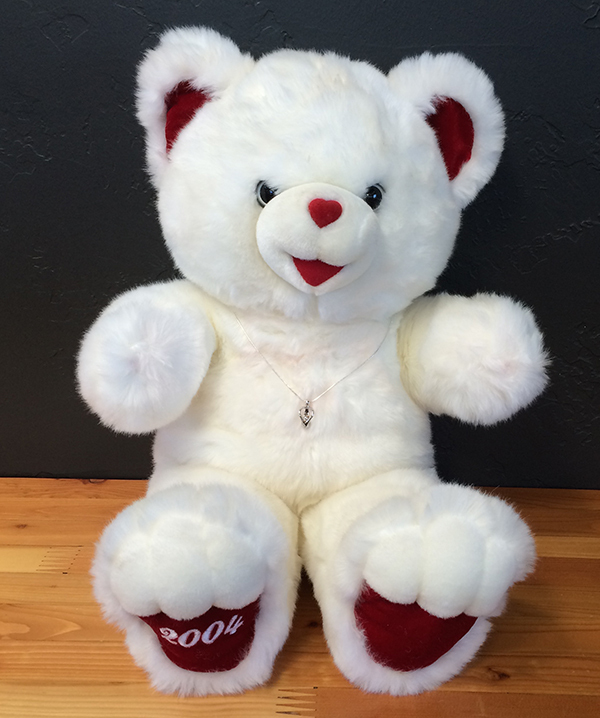 Maybe your child has a favorite stuffed animal that they have had since they were a baby. Maybe it’s a stuffed toy that your significant other won for you at the county fair. The keepsake can be place on a chain or a ribbon and tied around the neck or the body of the teddy and placed on the bed every morning after it’s made or even on top of a dresser. This is a beautiful gift idea as well for a friend or family member that has lost a child and may bring them some comfort in the difficult days ahead. Cremation jewelry is meant to bring some peace to a grieving heart by holding a small memory of your loved one inside a keepsake. Whether displaying on a person or in one of the many alternative ways above, cremation jewelry gives you the opportunity to keep a part of them with you in a manner that brings some comfort.